It was after 7pm by the time I got home from the office Saturday night and I had already planned a ‘leftovers’ night. Not wanting to break my streak of making an effort and trying something new in the kitchen as part of my personal recipe book challenge, I decided to attempt one of Annette’s desserts. 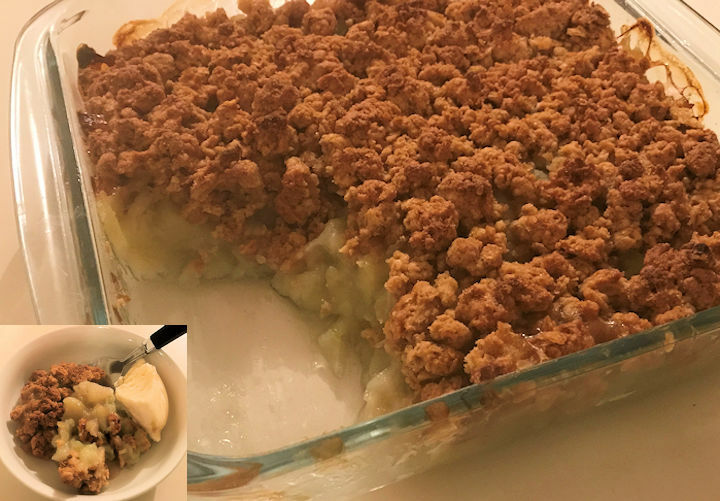 The Apple Crumble in Book 3 looked delicious and I had most of what I need already on hand, so it was an easy decision. The only thing I really had to ‘make’ was the crumbly topping. 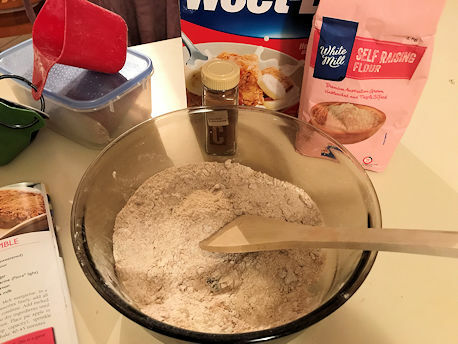 It was insanely simple and only took a few minutes to crush the weetbix and add in the flour, brown sugar and cinnamon. I had melt he margarine in the microwave when I began and once the dry ingredients were combined, I just mixed the skim milk in with the margarine before adding all the liquids to the bowl. 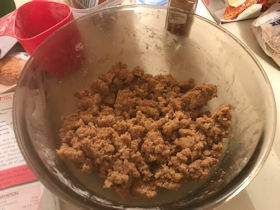 As it combines, it will start to resemble a crumble texture. If you have long nails like I do, you’ll probably want to wear gloves for this if you decide to get your hands in there. I was really slack with my liquid measurements (more like guestimates) and add a little too much moisture. This forced me to add an extra weetbix and touch of flour. It was still probably more moist than it was meant to be but I went with it anyhow. At this stage, you’ll want to fill the base of a baking dish with unsweetended pie apple. I literally poured this out of a can! 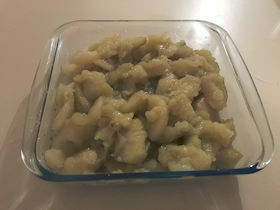 If I had more time, I’m sure I could have stewed my own cooking apples but my whole attraction to this dish was the fact I could feel like I was accomplishing something, even though I was in no mood to do much. 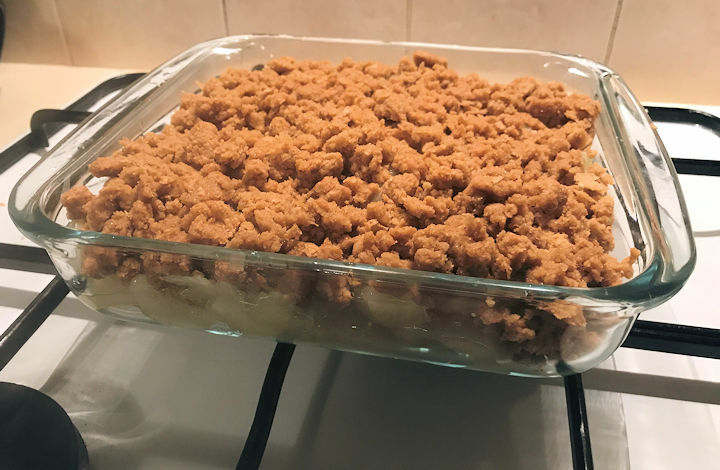 Now just sprinkle that crumble over top of your apple and this dish is ready for the oven. Mine took around 40 minutes cooking time. And here is the final product…. right after I served up the first bowl with a scoop of icecream for my eagerly waiting teenage son. It smells fantastic coming out of the oven… who doesn’t love the aroma of apple and cinnamon wafting from the kitchen? This one is a no-brainer for sure.It only took about 10 minutes to put together with ingredients commonly found in the pantry. I did have to buy the pie apples as I didn’t have these at the time. Being impromptu, I was limited to Coles selection of one overpriced brand at $4.25. There were 4 of us eating at home and I have half of the dessert left for another night, so that’s still pretty good for 2 evenings worth of dessert. Everyone enjoyed this and it was incredibly quick and simple to make. I will definitely keep this one in mind for the future. Another hit.